A meeting of the Committee on Privileges of Jammu and Kashmir Legislative Council was held under the Chairmanship of MLC, Mohammad Khursheed Alam, here today.Threadbare discussions were held on the breach of privilege notices given by MLC Surinder Choudhary against the Residence Commission Office, Kashmir House, New Delhi and by MLC QaiserJamsheed Lone against Superintending Engineer Electric Circle, Sopore and Executive Engineer Electric Division Kupwara, Kashmir.Legislators, Thakur Balbir Singh, Surinder Choudhary and Aga Syed Mahmood Al-Moosvi attended the meeting and gave their valuable suggestions to make the Committee more vibrant and result-oriented.The Committee was informed that the Resident Commissioner, JK House, New Delhi was expected to attend the meeting but due to sad demise of his father, the officer was forced to leave back and could not attend the meeting.The Committee expressed its deep shock over the sad demise and condoled with the Resident Commissioner. 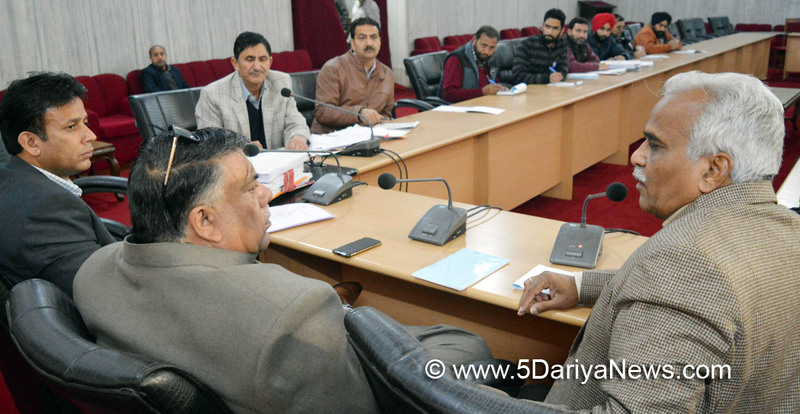 The Members also prayed for peace to the departed soul.In order to have brief about the functioning of Kashmir House, New Delhi, Former Resident Commissioner, Lokesh Jha briefed the meeting about the arrangements and other activities and said that the period involved in breach of privilege notice does not pertain to his tenure. He maintained that the department is ethically, morally and legally duty bound to take care of the protocol held by legislators, but at the same time the shortage of accommodation disrupts the same.The Committee sought the status report regarding officers/officials posted at New Delhi, date of posting, tenure/post, block wise detailed information regarding accommodation, charges, facilities provided on account of lodging and boarding with time to time and block wise detail to provide accommodation to guests with effect from February 2, 2016 to Feb 7, 2016 evening.The Committee expressed its dissatisfaction over the facilities and protocol being provided to the legislators at Kashmir House, New Delhi and decided to discuss all the issues in the next meeting.Later, MLC, Mohammad Khursheed Aalam also chaired another meeting of House Committee constituted on spurious drugs/equipment being supplied in the state.Threadbare discussions were held on directions and suggestions made by the previous House Committee headed by Dr Shehnaz Ganai.Legislators, Showkat Hussain Ganai and Ramesh Arora attended the meeting and gave their valuable views and suggestions regarding substandard and spurious drugs prevailing in the health institutions and market. The Committee sought a comprehensive detailed report on what action has been taken by the health authorities on spurious drugs and furnish the same to the members of the Committee so that they can scrutinize the matter and save precious lives of people of the state.The Committee also sought a status report on 43 testing laboratories which have already been declared substandard and what action has been taken against them till date.Special Secretary, Council Mohammad Ashraf Wani also briefed the Committee about the working and proceeding of previous House Committee besides, Additional Secretary, CM Secretariat, Sushil Kumar, Deputy Secretary Council, Ali Mohammad Rawat and other senior officers and officials of Council Secretariat were present in the meeting.